The following is a programmer circuit I made for P89V51RD2. 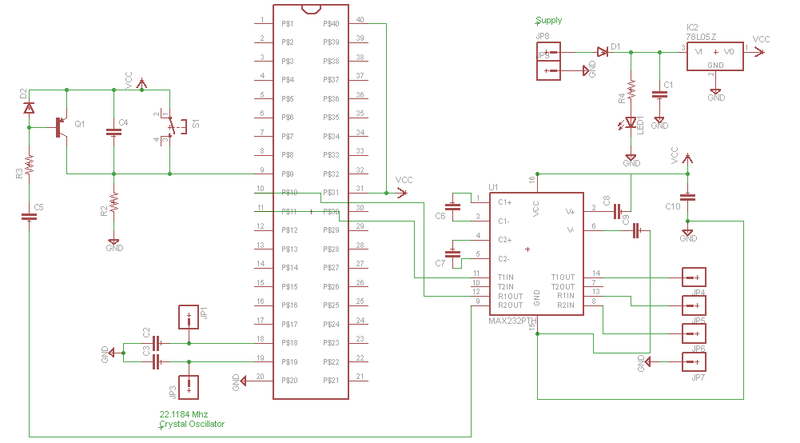 I made it using eagle, but the before ordering the components, I wanted to make sure that the schematic is correct. I would be greatly thankful if someone who has done this before can confirm that the schematic is correct and no correction is needed. The reason being this is the first time I am doing something like this, and I want to be dead sure before proceeding, due to budget concerns. I am still a novice in these stuffs. Also, by the time it comes for my major project in college, I want to be ready before hand. You don't have names on the microcontroller pins which makes it difficult to see any mistakes. Before embarking on this project did you know that the P89V51RD2 is obsolete and no longer made? It's last purchase date from NXP was almost three years ago now. I recommend you use something that is still in production. I think you should use wire-wrapping for the prototype. Then if you make a mistake you can easily change it or even remove all the components from the board and start again. Finally I don't think anyone else will want to take responsibility for making sure your schematic is "is correct and no correction is needed". Even experienced electronics engineers make mistakes with circuit design from time to time. My suggestion would be to have to extra in your budget to fix any issues. I read it on some posts, but found some in certain shops that they are still available. But thanks, I will move on to better ones. Will do. Thanks for all the advices. Very helpful.